Cormant-CS is a World leader in cable connectivity software. Since 2002, and initially sold as CableSolve, Cormant-CS has the ability to track end-to-end connectivity of all your infrastructure, in a Data Centre, workstations and/or campus. 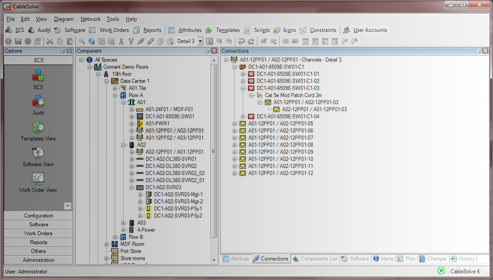 All chains in a connection can be displayed in a graphical format on both the desktop pc’s and hand held barcode scanners. By knowing what is connected to where, recovery time from outages can be dramatically reduced, with the old method of ‘tug and trace’ no longer required. With the release of Cormant-CS, users are now able to view a host of information related to their Data Centre, client floors, a whole campus, or an entire World Wide organisation. 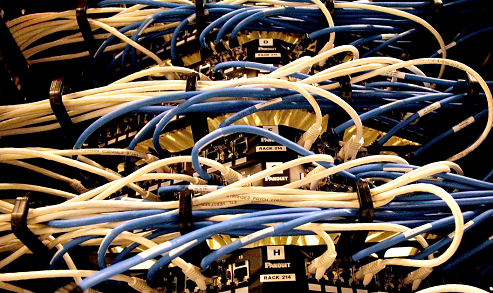 Unique icons are used that show a chain of connections, from a simple patch panel to patch panel configuration, to a boom gate in an Airport Car Park, with all connections (including media converters) back to the Data Centre or computer room. Cormant-CS has an advanced but easy to understand graphical view of cable connectivity. Whether you are connecting via patch panels, wall outlets, or video distribution, a complete end-to-end view of all the cable connections will be displayed in a easy to understand windows treeformat. Individual graphical icons designate the type of cable in the system, as well as the patch panels, wall outlets and components (servers, switches etc). If you do not like the standard ones that are supplied with the system, you have full control to easily modify or create an entire set of your own. Unlike similar ‘active’ patch solutions, Cormant-CS can include any type of cable (past, present or future) to be added in to the system. With templates already created for Power Cables, Fibre, Copper, Serial, SCSI, KVM, with standards such as Cat 3,4,5,6 & 7, OM1, 2, 3 & 4, COAX, SCSI, Serial and infinity band to name a few. Our customers have the flexibility to create their own cable types (and cable standards) if their organisation requires a ‘unique’ type that is not in the system. What are some of the Benefits of knowing Connectivity?